The chain of events is as follows, I had a Vizio 1080p tv with the yamaha and listed speakers, which worked magnificently. Then I upgraded to the TCL 55R617 tv, which i found out is not compatible with the yamaha receiver i had. A thorough look through forums informed me that the TCL and Yamaha have a "handshake" issue in which it would not pass through the propet audio formats and also make the tv screen flicker consistently after an hour of use. So i then sold the yamaha and got the Onkyo TX-NR787 two days ago. A significant upgrade over the yamaha. My yamaha being a 5.1 limited my options, but with this Onkyo 9.2 (9.1 really since the other sub input transfers the same signal to both) I'm able to do much more. My plan is to Bi-wire the front monitors and then with the remaining two channels purchase two add-on Dolby Atmos speakers, making it into a Bi-wired 5.1.2 system. Yet right now im at a loss as to which add-on speakers to get that would timbre match my current setup. There are the Onkyo SKH-410 being the cheapest option at $90, followed by the sonys SSCSE addons at $160, then the NHT Atmos addons at $200 ($100 each). Which is where my budget stops. If anyone may give me some insight as to what are my best options for this? Or what speakers may i add that are in my $200 budget, i would highly appreciate it. Thanks. I believe you intend to bi-amp, not bi-wire, so I'll save you the waste of time as you cannot bi-amp with an AVR. Period. NHT would be the closest match, but remember it's an atmos speaker, just ambient sounds will come out of them so timber matching isn't all that important. I'd say save the coin for another upgrade. Yes, you are right, i meant to say bi-amp. But i do not understand what do you mean by that an AVR cannot do it? 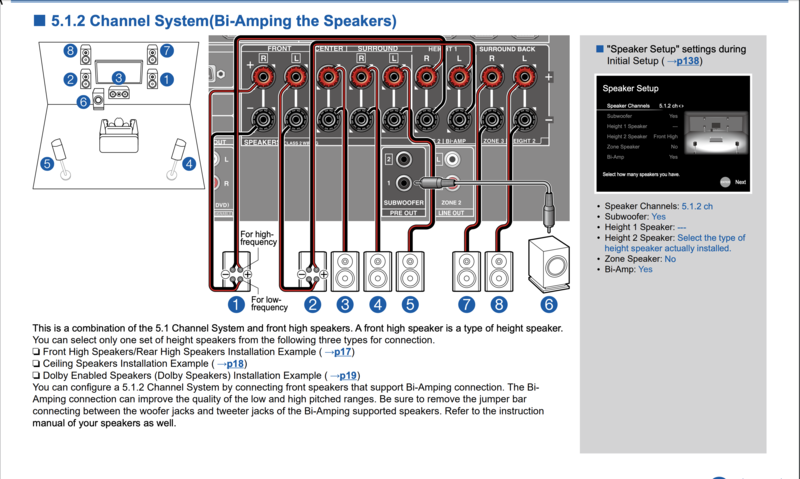 In the attached screenshot of the NR787 it clearly shows how one may do so, as well as right there on the amp itself. Bi-amping with an AVR is just marketing. You have ONE power supply for everything. You are just trading power, It's like putting a splitter on a garden hose and trying to fill a pool quicker. It's the same amount of water. For Bi-Amping you would need a separate amp(s). Best to just run full range and replace the brass jumpers on the speakers with good speaker wire. Right now it looks like you have a good 5.1 system. Yes you can add ATMOS speakers and make it 5.1.2. Just remember every time you add more speakers that drains more power from your ONE power supply. In HT systems it is best to try and match all your speakers to the same manufacture and product line. For surrounds and effect speakers it does not matter that much. Most AVR come with good calibration programs that will EQ them in the system. Like @mrloren said, it’s marketing, no more. You are of course free to do as you please, but there will be not sonic benefits, perhaps even sonic deficits. That was quite a vivid example with the garden hose, thank you for the explanation. Now that my bi-amp plan is debunked and over with, and my atmos idea is also on the brink of being annulled, I'm left with little to work with. As for the wire, I've been using for past 5 years mediabridge 16awg wire topped with Sewell direct SW-29863 deadbolt banana plugs. What kind of speaker wire would be an enhancement to my current wire/plugs? Which is a great idea actually, which ones would be good to go with? That Media Bidge wire is not that great @ 16AWG. I find the starter wire to be Monoprice/Amazon Basic 12awg. You can go up from there. Doug's Furez is darn good wire https://douglasconnection.com/Raw-Speaker-Cable_c33.htm Doug's a forum member and gives discounts to fellow members. I went from the Furez to Audioquest Type 4. 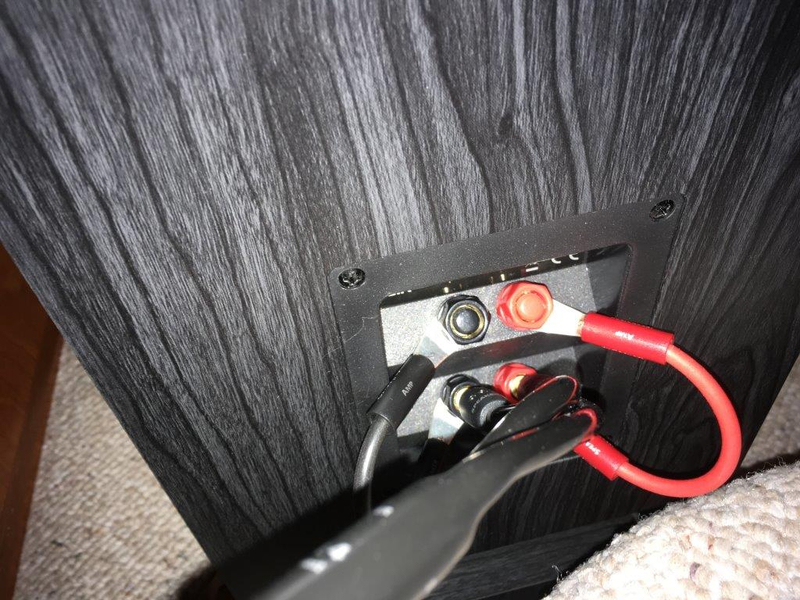 I'm currently using AQ Type 4 for my front 3 speakers and have Monoprice 14awg going to my surrounds and Belden 16awg to the ceiling speakers. In my bedroom HT I have Furez for the front 3 and 14awg Monoprice to the surrounds. Both systems sound great. One thing is on this forum. We will help you spend all your money. Once done you will have an empty bank account and an awesome HT. Ditto on that haha. I was unaware that good wiring can get so darn expensive. Yet some necessary changes must be done. Thanks for the eye opener on that one. Think ill go with these spades I found on ebay they seem to be from a reputable enough seller. As for the wires I'm gonna replace the fronts + center, and the sorrounds will leave be, as they are too much of a hassle to even touch lol. A question, if I leave the 16awg on the sorrounds and put 12/14awg on the rest, that would be alright? and also, i ran across so called terminal caps for the receiver, is that a thing or just a gimmick? nvm about the ebay spades, will do it myself, with the help of Furez 10awg and Furez SP8 WP38NP Bare Copper Spade. Then for speaker cables will fashion out of Furez 14awg and sewell deadbolt banana plugs. its alright?